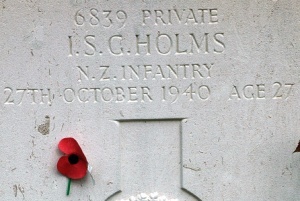 Private Ian Holms was one of the "originals" of the 22 Battalion. He was born in Featherston in 1913, and as with many from the Wairarapa area he enlisted early and was posted to the 22 Battalion. 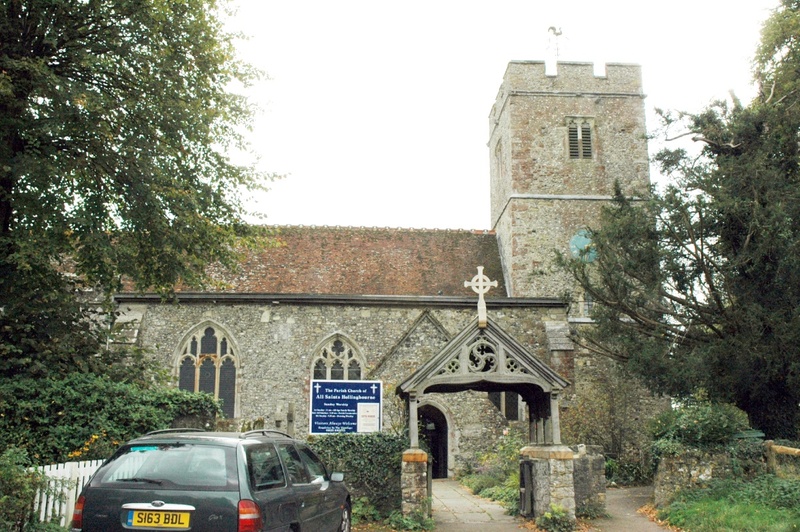 He sailed with the battalion in early 1940 and followed its fortunes in England, eventually being billeted with the rest of A Company at Greenway Court, a farm house and outbuildings near Hollingbourne, Kent. The Battalion Diary records the place as "..Just an ordinary everyday farmhouse surrounded by the usual, yet typical, Kentish outbuildings... Its old disused oasthouse and stable housed two platoons...". 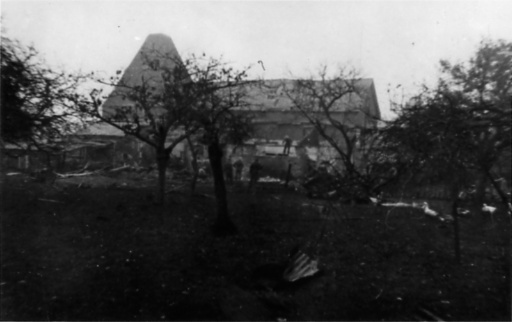 "On the night of 27-28 October a bomber jettisons its bombs: one man killed, Private Ian Holms, the battalion's first death from enemy action, and three wounded in A Company." Thus Pvte Ian HOLMS has the honour of becoming the Battalion's first casualty of the war caused by enemy action. 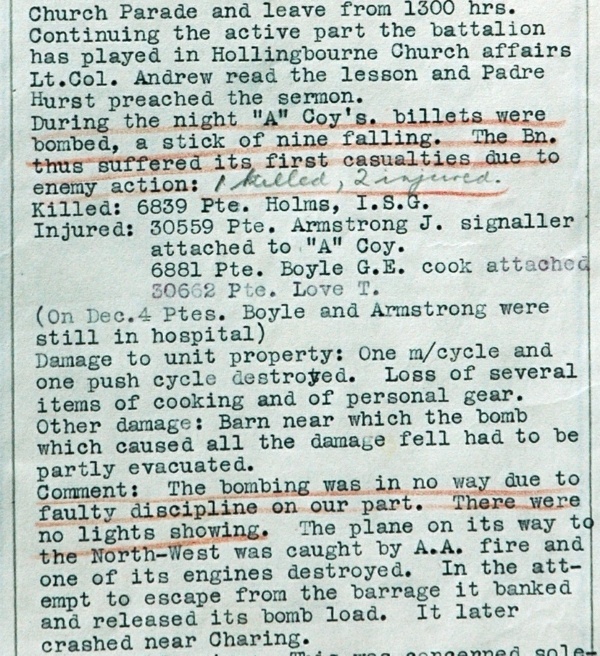 The incident causing his death was recorded in the Battalion's War Diary, and in the Routine Orders. 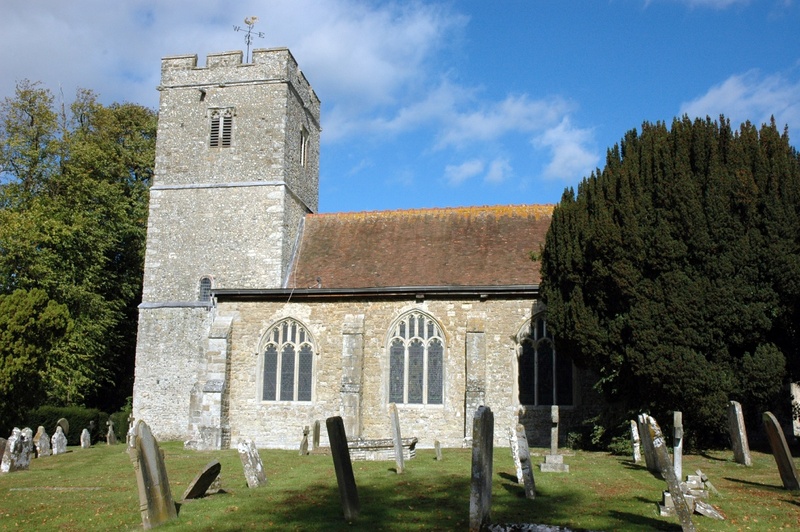 The village of Hollingbourne is a few miles NE of Maidstone. At the rear of the General Cemetery is a Commonwealth War Graves section, where Ian HOLMS and several other New Zealanders are buried. 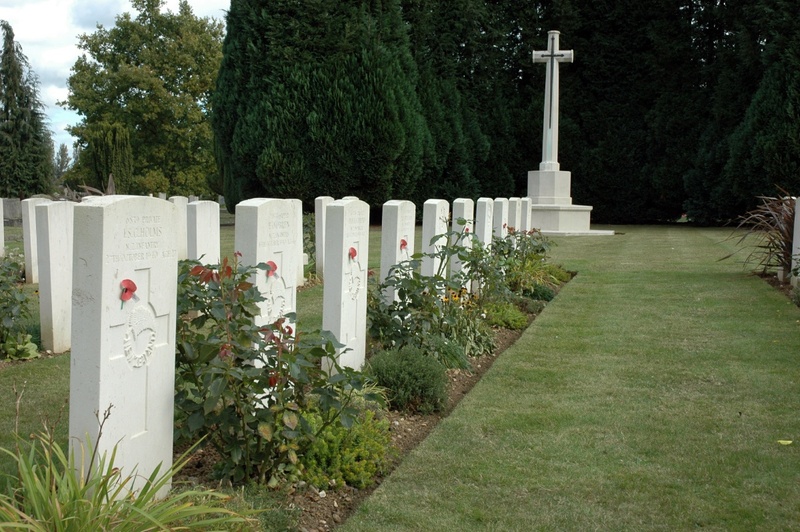 With war graves, the CWGC often relocated burials after the war, moving bodies from where they had been buried into a new, purpose built cemetery. This was usually the case for burials near the front line. 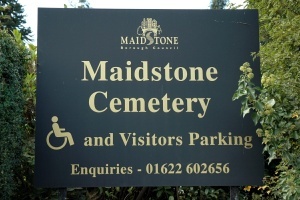 However in Ian Homs' case, it appears that he was buried at Maidstone at the time of his death. 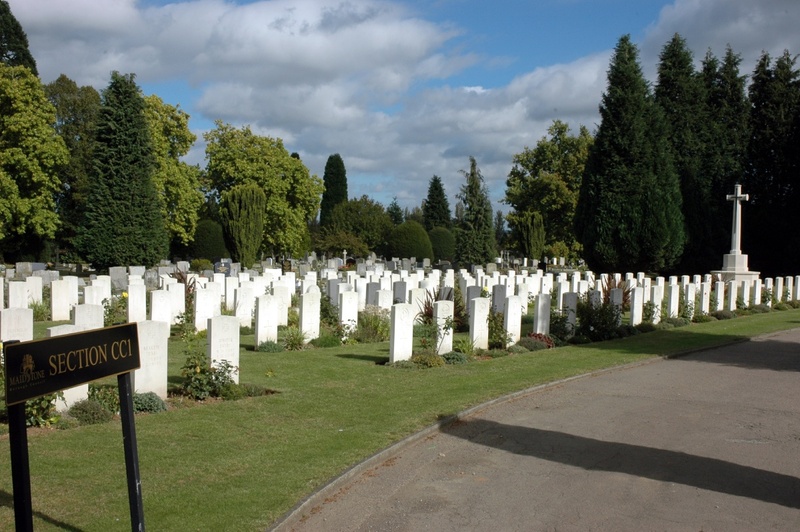 Today the CWGC Section is neat and well tended, a fitting tribute to the New Zealanders and other soldiers buried there. In October 1940, Ian's younger brother, SGT Bob HOLMS of the Divisional Cavalry, was stationed nearby and he was able to attend Ian's burial. 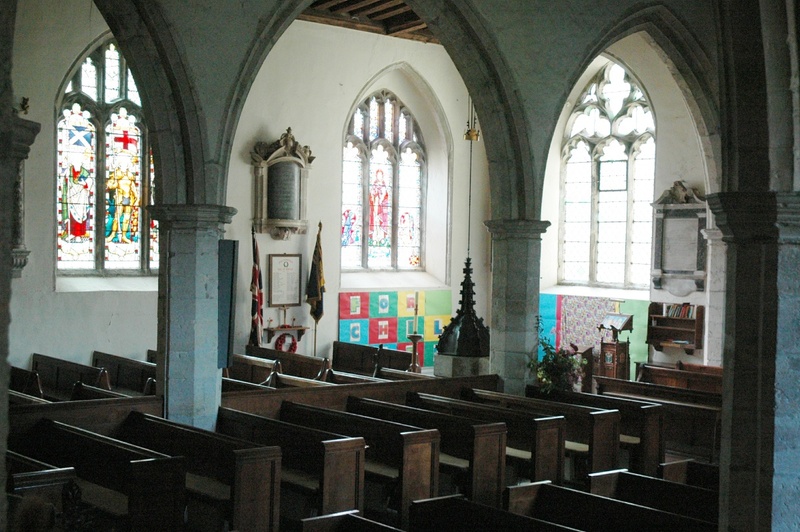 He took photos of the service which he sent home to their parents. 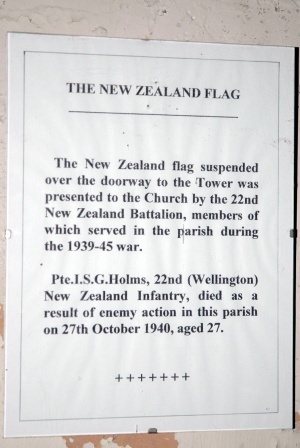 The original cross marking the grave of Pvt HOLMS. 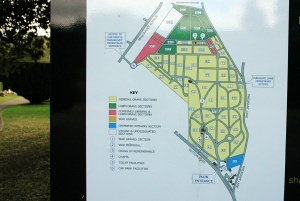 The map of Maidstone Cemetery. the Commonwealth War Graves section, labelled CC, is in the rear. 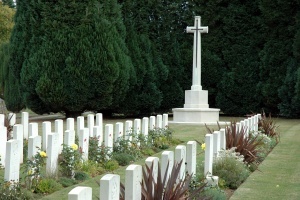 General view of the War Graves, Section CC. The Cross of Sacrifice at Maidstone Cemetery. Note the flax bushes amongst the NZ headstones. Row of NZ headstones (with red poppies). The closest headstone is that of Private Holms. Private Holms and the 22 Battalion are also recorded at All Saints Church, Hollingbourne, where the Battalion regularly attended Church Parade. 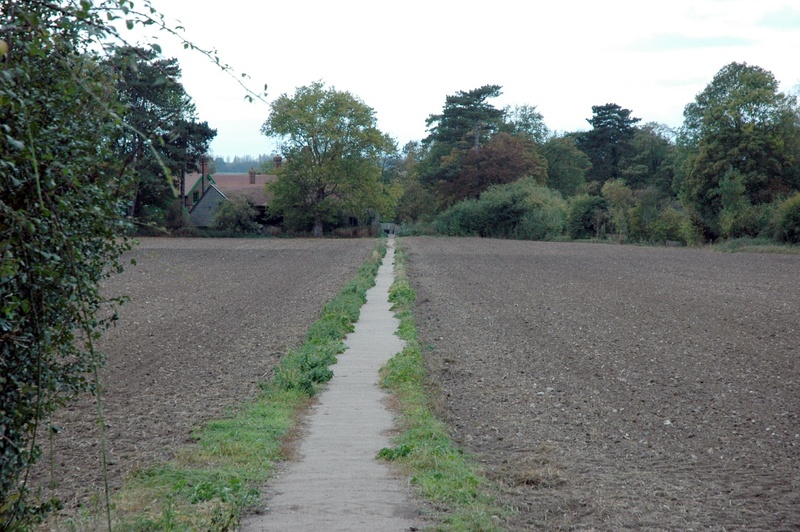 Pathway leading across the fields to the Church - a path that many of the 22 Battlion would have trodden. The entrance to All Saints Church. General interior view, with the Hollingbourne Roll of Honour and Servicenen's memorial between the pillars. 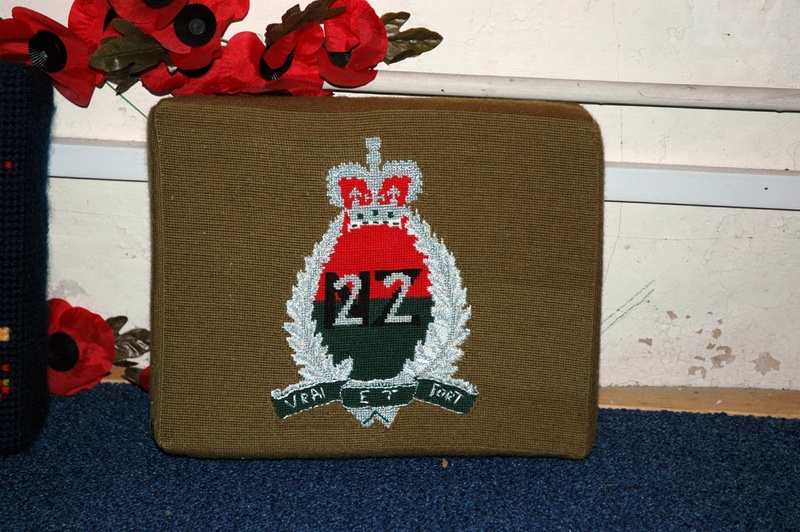 The Servicemen's Memorial, including a kneeler remembering the 22 Battalion. 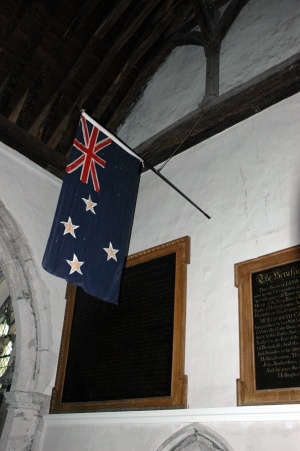 The NZ flag over the side entrance to the church. The original was presented to the parish by Lt Col Leslie ANDREW, CO of 22 Battalion. 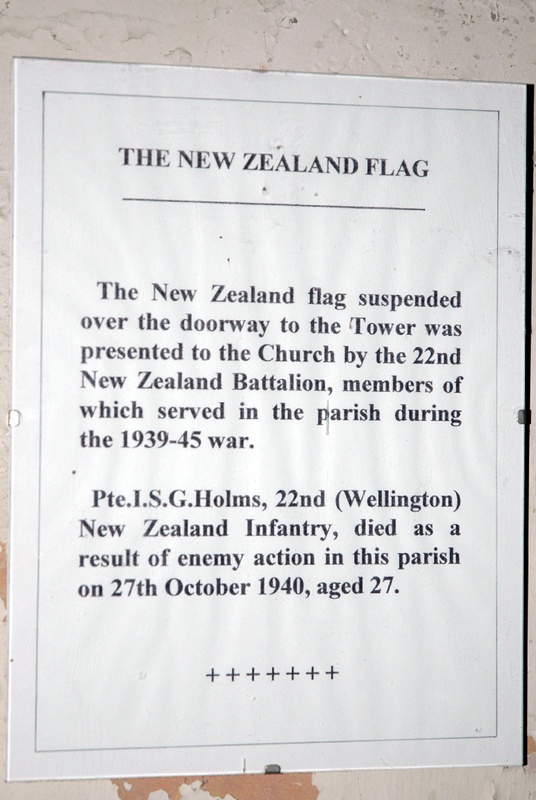 In November 2015 the Wairarapa Times newspaper ran an article about Ian Holms as part of a series on our war heroes. The original can be viewed here. 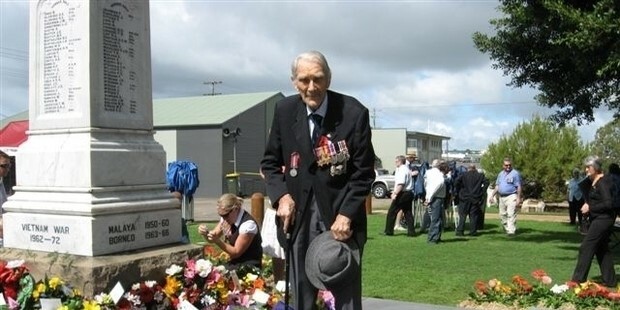 EMOTIONAL: War veteran Grant Holms, brother of Ian, is pictured at Anzac Day in Hervey Bay, Australia, in 2011. He was then 100 years old but has since died. PHOTOS/SUPPLIED We both feel very privileged to have attended the small but stirring service at the Commonwealth War Graves Cemetery in Maidstone, Kent, a service led by the Shepway and Parkway Royal British Legion, honouring the many servicemen who paid the supreme sacrifice, particularly during the darkest days of the Battle of Britain. 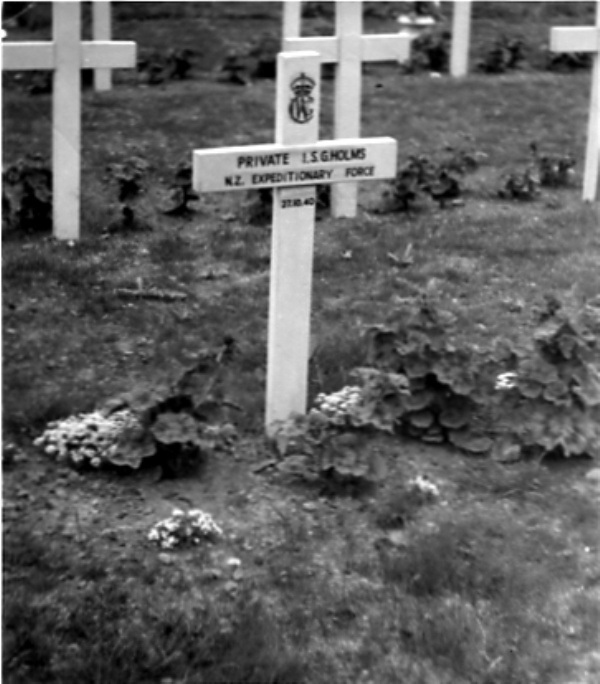 Amongst those buried there is my uncle, Pte Ian Holms of the NZ 22nd Battalion, serving at the time in the HQ Company, Anti-Aircraft Battery, providing a much needed role in helping to defy an impending German invasion, following the fall of France. 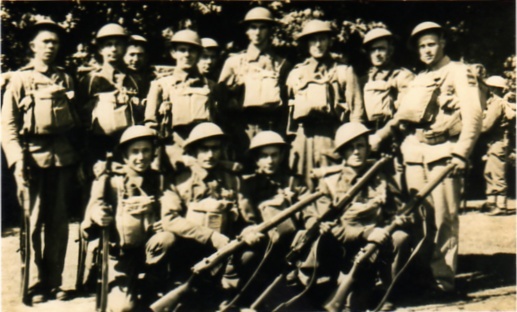 Enlisting with the Second Echelon 2nd NZEF and originally destined for the Middle East, the "tourists" as they were irreverently known, arrived in Scotland in June 1940 before boarding a train to take up their positions in Kent. 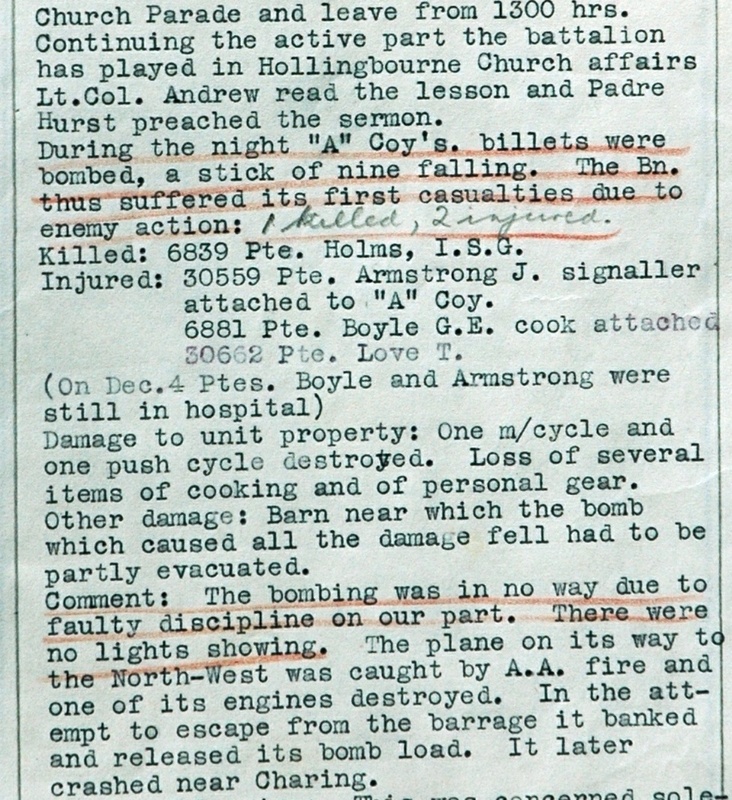 While in Britain Ian and his younger brother Robert took the liberty to visit relatives in Scotland and England, bringing newspapers and news from Godzone. The sight of New Zealanders roving round the homeland helped to boost morale. A cousin of the family, Jean Fulton, can remember as a proud 10 year old showing off her cousin Ian to her friends in his resplendent khaki uniform and the unique lemon squeezer after he had arrived unexpectedly on their doorstep while on leave. Travelling however, was fraught with hold-ups to train services. Commanded by Colonel. Andrew VC, a stickler for discipline, "Old February" as he was known, had no compunction dishing out punishment for soldiers being absent without leave. "Am I to understand you were late returning because there was a bombing raid? "Well then, you should have taken an earlier train. Punishment - 28 days loss of leave." 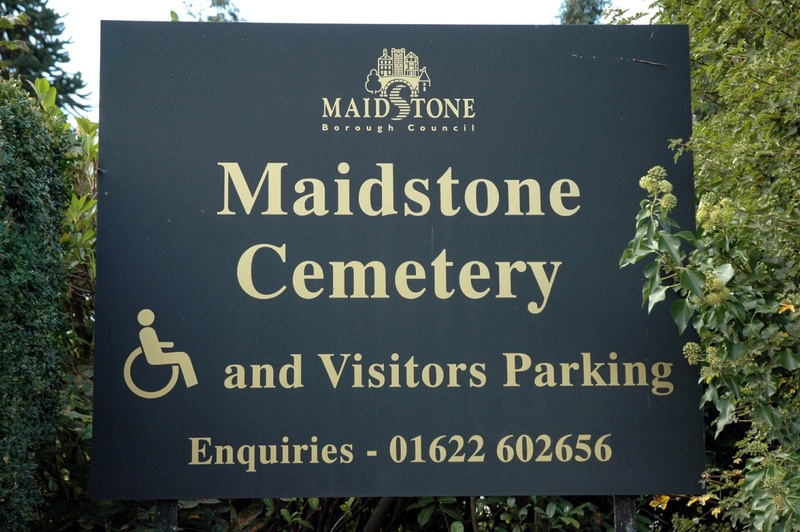 It was on the night of October 27th, 1940, that Ian Holms was to have the ignominious distinction of becoming one of the first New Zealand soldiers to be killed in action while on duty at the Old Putnam Priory in Maidstone. About to bed down for the night, after a Sunday church parade and sporting encounters with rival units, an enemy bomber hit by anti-aircraft fire released its pinion of bombs before crashing five miles away. One of the jettisoned bombs dropped outside the priory. Bursting upwards, it inflicted its fatal explosion on Ian and wounded three other soldiers. Ian's brother Bob, serving with the Divisional Cavalry, attended the funeral and later wrote to their eldest brother Grant, serving with the First Echelon in Egypt, expressing how Ian's death was peaceful with Ian, having been nursed in the arms of a fellow soldier, Charlie Merrylees. Unlike so many of his battalion, he at least was to receive full military honours, in a service conducted by Rev Walter Hurst, soon to become a prisoner-of-war (POW) in the battle for Greece. 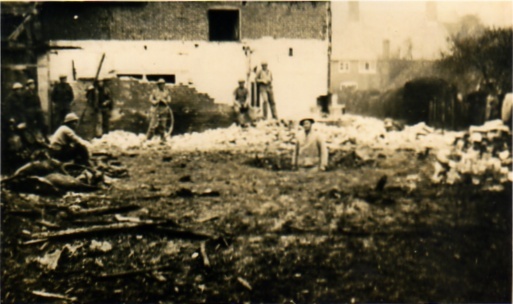 The battalion was well liked by residents with many servicemen hosted in their homes, enjoying the picturesque surroundings in Kent. 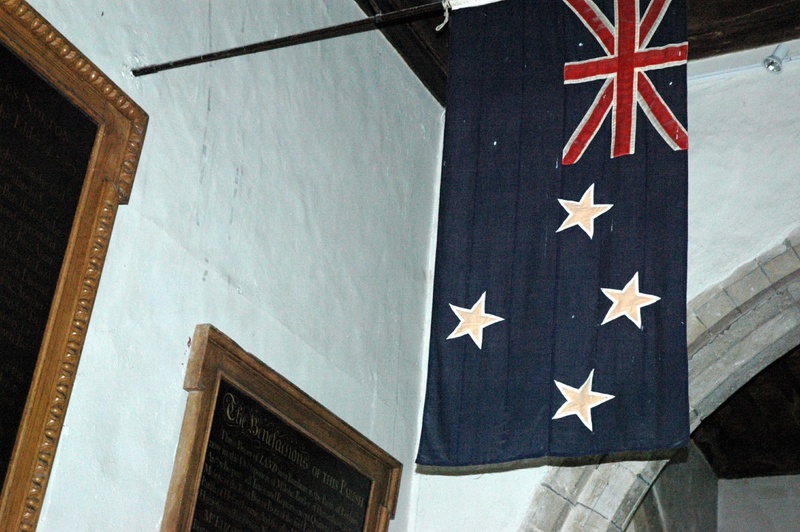 For many years my grandfather Archie Holms would receive letters from the Mason Family in Maidstone, telling him of their inner-bound duty to tend to Ian's grave on Anzac Day and Remembrance Day. 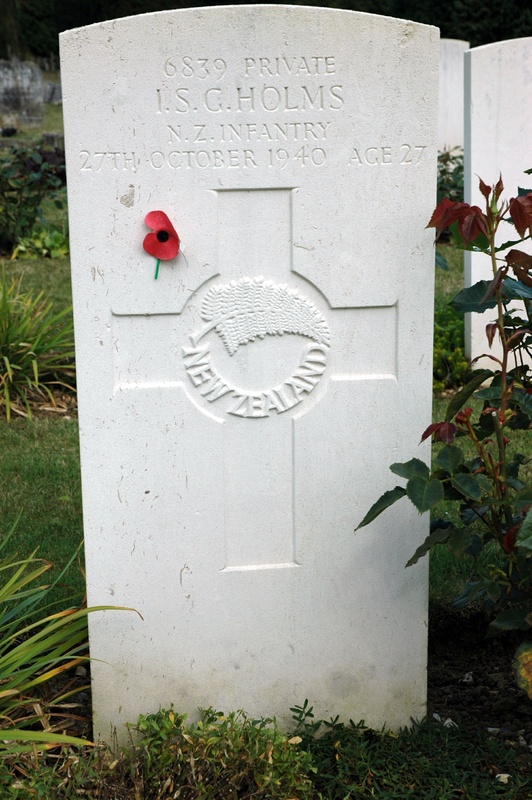 Amongst the 15 NZ servicemen buried in the Maidstone cemetery was the 28th Maori Battalion's first casualty as a result of a motorcycle crash, Pte Tokena Pokai, son of a Maori MP. Another tragic figure lying alongside is Scots born Pte Alex Meikle of the 27th NZ Battalion, murdered by a fellow New Zealand soldier. 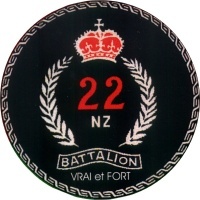 The 22nd Battalion was to distinguish itself in campaigns in Greece, North Africa and Italy. 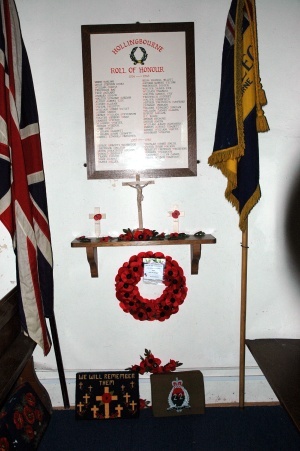 Along with Keith Elliott's VC, (and incidentally, as fortune would have it, his company had only vacated the barn where Ian was killed the night before), many soldiers of the 22nd were to receive decorations for conspicuous bravery and dedicated service. A posthumous St George Cross was awarded to Lance Corporal David Russell, dying in front of a firing squad for refusing to reveal key information on Italian families assisting the war effort or information on escaped POWs. 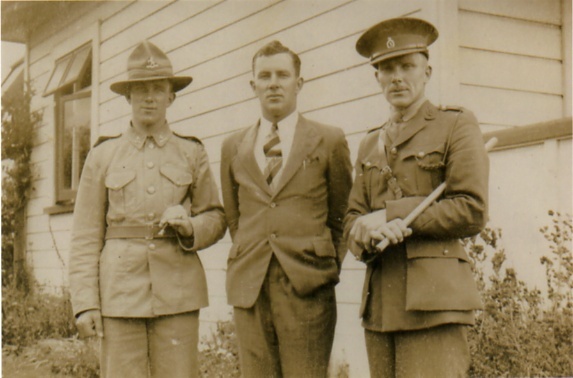 Haddon Donald DSO became commander of the battalion and would later serve as a National Government MP - representing Wairarapa in Parliament. 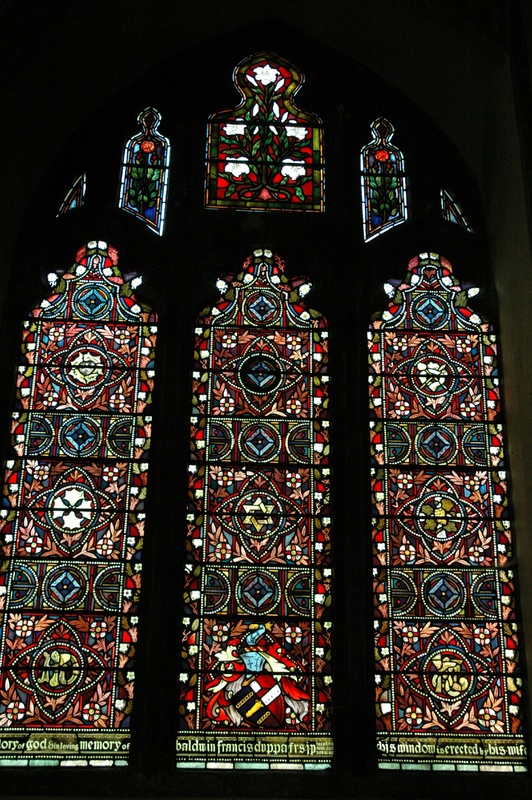 He is still a resident of Masterton. Major-General Sandy Thomas, an author and the last commanding officer of the battalion in Japan, would later become the last Commanding Officer of British Forces in Far East Asia. Another battalion padre Rev Martin Sullivan would become Dean of St Pauls, officiating at Sir Winston Churchill's funeral. 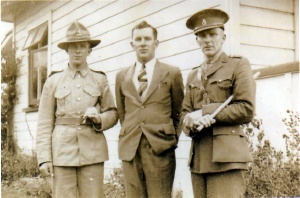 Being Kiwis, the battalion had its fair share of All Blacks, with Jack Sullivan, Vince Bevan and Athol Mahoney prominent. To cap it off one of the Intelligence Officers was the journalist, Terry McLean. 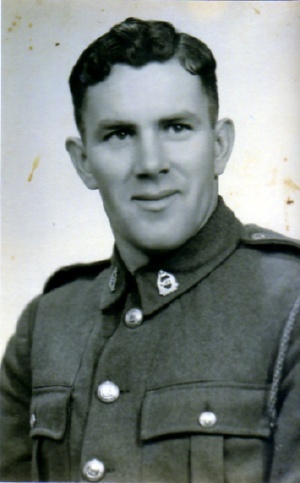 If ever there was a seed of hope to emerge from the tragedy of Ian Sutherland Gordon Holms, it would be that of a nephew, named in memory of her brother by Betty and her husband Ray Falloon, himself a Crete veteran. 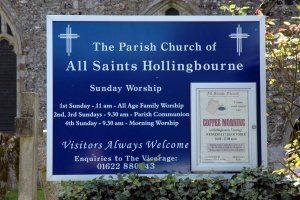 Professor Ian Robert Holms Falloon would become a world authority in the treatment of schizophrenia and the introduction of early intervention community health programmes, particularly in England where he later lived. Having graduated from the University of Otago Ian Falloon started work at Maudsley Hospital, London, in the early 1970s. 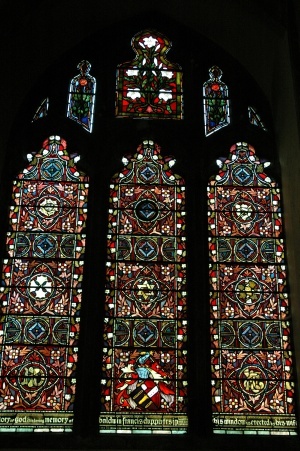 It was from there that his research would take him to the dizzy heights of the University of Maryland, in the United States as Associate Professor, instigating the Buckinghamshire Experiment he led in England, and for a short missionary capacity, Emeritus Professor of Psychiatry at Auckland University where a lecture theatre is named in his honour. Professor Patrick McGorry who was named Australian of the Year in 2010 spoke eloquently on Ian's virtues and contributions to mental health at the memorial service held in Birmingham, England. If there is an utterance to be shared from one of so many soldiers who paid the supreme sacrifice, it would be a great vote of approval that, like his great-aunt Selina Sutherland, a sense of pride must surely trickle through those hallowed grounds from where he now lies. Our thoughts and grateful thanks must extend to those who continue to preserve the memories of those good souls now lying in far flung Commonwealth War Graves cemeteries.